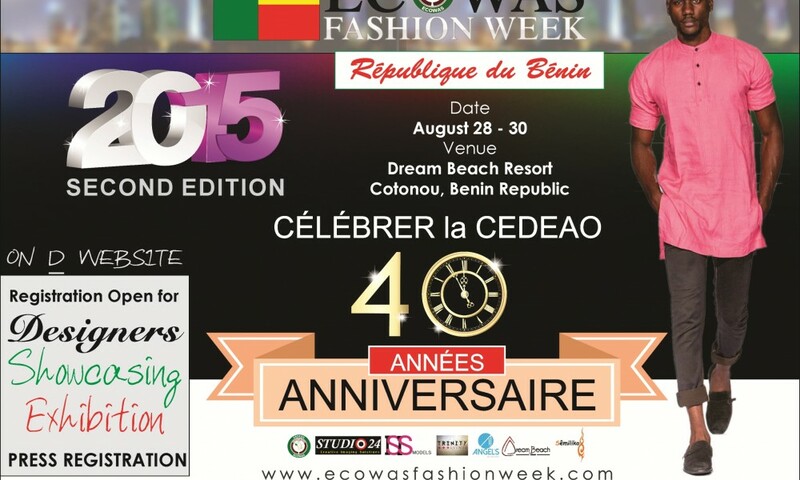 The Economic Community of West African States marks its 40th Anniversary with a fashion Week in Cotonou, Republic of Benin that is to take place from 28 August to 30 August 2015. Ecowas Fashion Week currently in its second edition is recording successes already on the building “fame board”. The organizers of EFW are mostly interested in building, expanding and encouraging fashion, and a common market hub amongst the West African States. ECOWAS-governed region is comprised of fifteen (15) countries: Benin, Burkina Faso, Cape Verde, Cote d’Ivoire, Gambia, Ghana, Guinea, Guinea-Bissau, Liberia, Mali, Niger, Nigeria, Senegal, Sierra Leone and Togo. 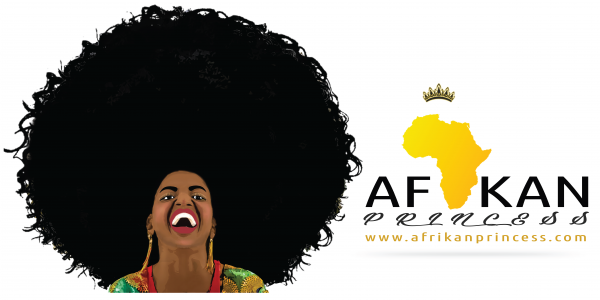 To revive the African culture through fashion. To promote the dignity of womanhood. To open new windows of business opportunities. To encourage indigenous fashion designers. To redefine fashion shows by showcasing other fashion accessories. Encouraging the exportation of local designs in the region. Ecowas Fashion Week will also have an awards segment where people who have made great contributions to the fashion industry.In this second edition, anticipation gets a step higher as the organizers – IBCNL, Lagos Nigeria team up with major corporate bodies in the Republic of Benin such as Trinity Events (handling the event) and Angels Modeling Agency to launch the 2nd edition of the ECOWAS Fashion Week. The event will be attended by many International Super Models, Celebrities, Renowned African Designers, and several other fashion brands. 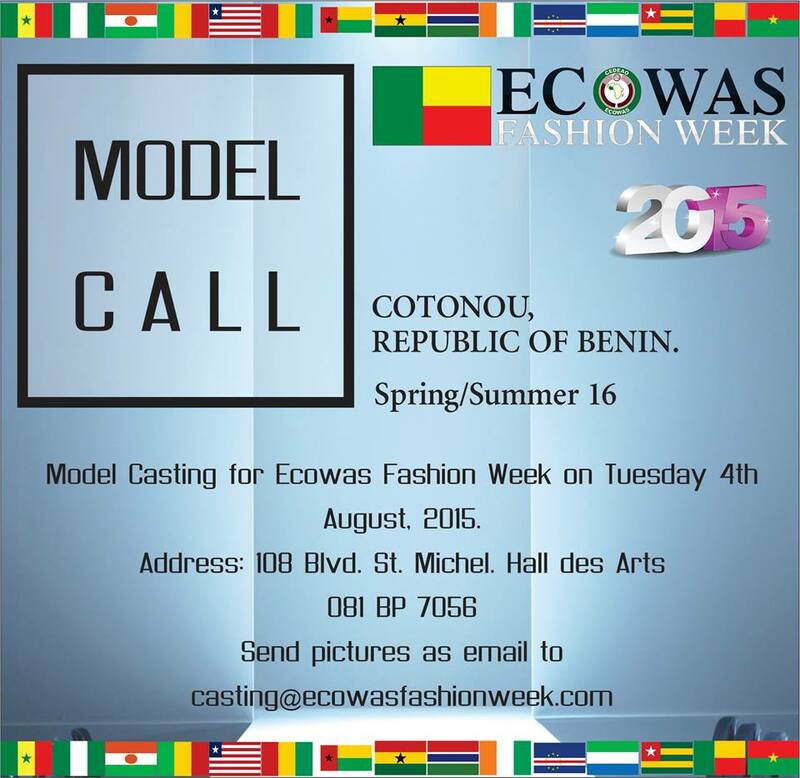 I f you are a model and would like to wall for some of Africa’s greatest designers then email pictures to casting@ecowasfashionweek.com .The casting is on the 4th of August 2015.